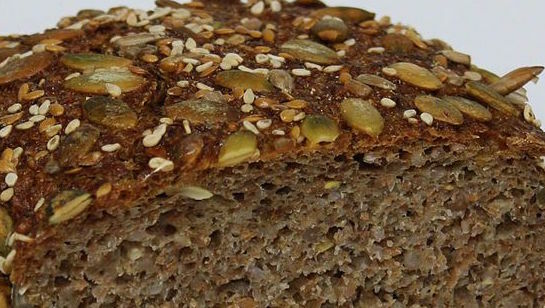 A healthy, yeast free wholemeal bread that’s quick and easy to make. Spelt is one of the oldest cultivated crops in human history and is believed to have first been used 9,000 years ago. Spelt is closely related to wheat but is more nutritious than other forms of wheat. Spelt is rich in B vitamins, zinc, magnesium, copper, phosphorous, selenium, copper as well as protein and fiber making it a great health promoting food. Spread walnuts on an English cake baking tray (preferably made from pyrex or stainless steel) and place in the oven to roast for 7-10 minutes. Remove from oven and allow walnuts to cool. Chop into medium sized pieces. Slowly add the water and molasses to the dry mixture and mix together with your hands. Place the mixture into oiled baking dish. Remove bread from baking tray and allow to cool on a rack. While cooling, brush bread with olive oil to make it softer. Makes an excellent breakfast toped with almond seed paste.